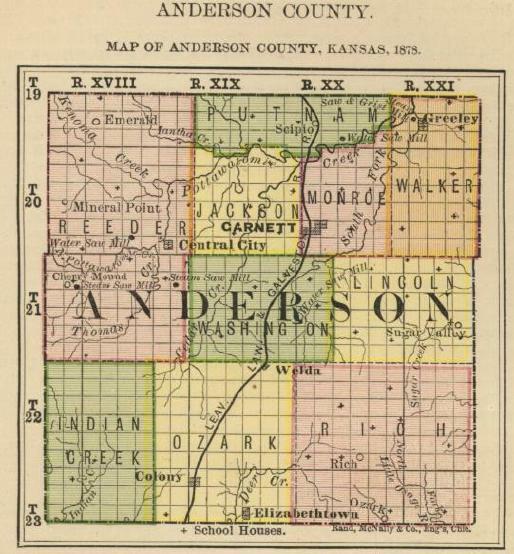 courtesy of Pam Reitsch Anderson county is one of the original counties of Kansas. On May 24, 1854, Kansas officially became a territory and was opened to settlement. 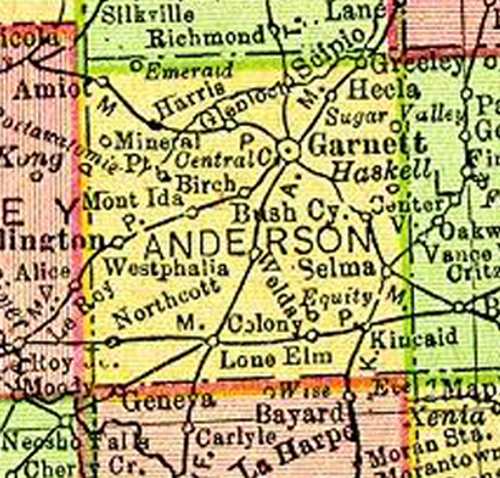 Anderson county was formally organized on January 7, 1856, and Garnett became the county seat on April 5, 1859. Greeley, the first town in Anderson county, was surveyed and laid out in April of 1857. Anderson county is bordered by Franklin county on the north, Allen county to the South, Coffey county to the west, and Linn county to the East. All information herein is the property of its respective contributor(s). Presentation on these pages does not confer permission to any other organization or individual to display these materials anywhere other than the Anderson County KSGenWeb site. No part of this site may be reproduced for any purpose without the explicit permission of its owner and/or contributor(s).